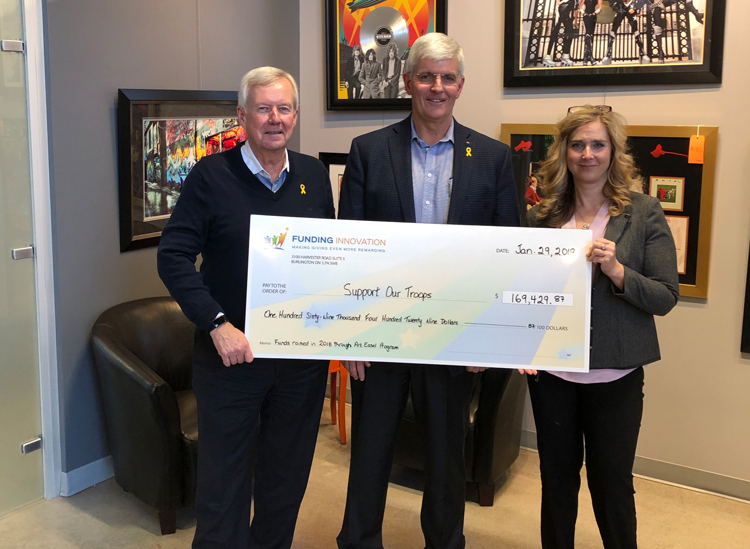 On January 29, 2019, our partner, Funding Innovation, presented Support Our Troops with a cheque for $169,429.87! These funds were raised through the Support Our Troops Art Easel Program — a simple and risk-free fundraising initiative for Support Our Troops and the easiest way for a host of partners to support this important cause. For the past two years, the Funding Innovation team, in conjunction with Support Our Troops, has been enlisting a host of business partners to join the mission to raise funds for Support Our Troops by hosting Art Easels within their establishments. To date, Art Easels are present in Giant Tiger, The Beer Store and CANEX stores across the country. This combined partnership have also been making overtures and enlisting a number of businesses and airports to build a coordinated network of support, through its “Highway of Heroes” with partners like ONroute Service Centres and Flying J, and “Airway of Heroes” with a large number of airports providing space for easels throughout. These include international and regional airports from coast-to-coast including - Ottawa, Kelowna, Abbotsford, Moncton and Comox. “We are proud to partner with Funding Innovation to help ensure the men and women who serve our country receive the support they need. They have proven to be an invaluable partner to date!” said Steve Fash, Vice-President of Corporate Services, Canadian Forces Morale & Welfare Services.